My first Svevo and no doubt I'll be tracking out a copy of Confessions of Zeno or A Life in the near future, first appeared in 1898 as Senilita which I think that if there was to be a revised translation it would have to come with the closer title of Senility, given the title veers to explaining the affects of a blinding love, rather than the condition developed with age. It was great to read this novel championed by James Joyce. Although Beryl De Zoete's translation first appeared in 1932 it remains a solid read. 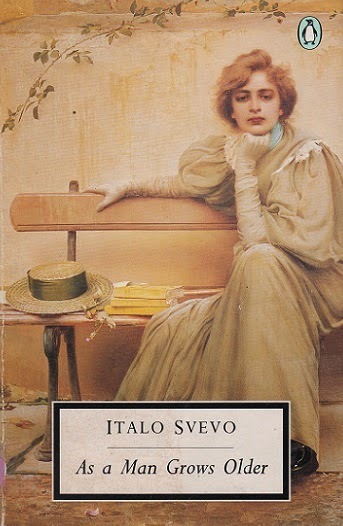 Set in Svevo's native Trieste, the central character Emilio Brentani, is a part time writer who achieves some fame as a self published novelist, (echoes of auto portrait), who becomes obsessed with the younger Angiolina, she already has a marriage lined up with Volpini, over the course of the book it becomes obvious that Angiolina is playing the field and that Emilio's love is under fire on many opposing fronts. An aspect of the novel which is striking in a novel from 1898 is that of it's explicitness, there's is talk of them 'making love' in the open, perhaps in contemporary terms this would be described as 'making out', although later in the novel they organise in booking a room for their love making, another stark quality is that when Emilio beats Angiolina, physically dominating her. Another quality of the book is it's unflinching descriptions of it's characters interior psychologies, towards the end of the book the focus shifts from Emilio being centre stage and casts it's gaze at his sister, Amalia, who descends into a melancholy, dependant on inhaling drugs, suffering from hallucinations, and physical weakness and eventual death, the pair live together after the death of their parents, and like her brother Amalia finds herself deep in infatuation, with one of Emilio's friends, it's kind of strange that while the bulk of the focus of the novel is on Emilio in the background is another equally absorbing story being played out of equally strained psychology, only this one has more profound consequences, the balance and portrayal of these two story lines juxtaposed together makes for fascinating contemplation. An absorbing introduction to Svevo, I hope a revised or perhaps updated translation surfaces soon, the Penguin edition I think is out of print, although As a Man Grows Older is available through nyrb.